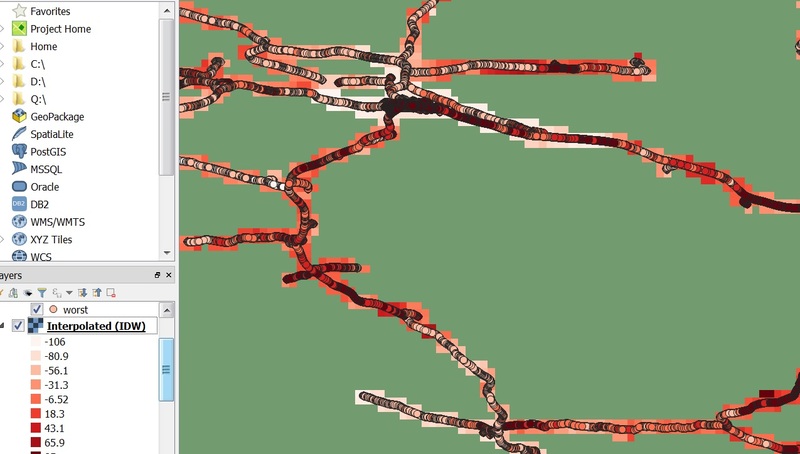 I have done interpolation (IDW and Nearest Neighbour) in QGIS. But interestingly the output shows the wrong result. The area where I have a huge number of points results in a lower Z value (it is supposed to have a higher Z value). Is it because of the overlapping points? Another doubt is that kriging algorithm does not show the predicted value (i.e. predicted value is not in the Z value range -160 to 80), though the output curve is meaningful. The prediction shows values in the range -120 to -70 or so. What might be the reason? Browse other questions tagged qgis interpolation kriging nearest-neighbor inverse-distance-weighted or ask your own question.